The bipartisan effort to keep DREAMers in the US collapsed, kicking the debate over illegal immigration back into the public sphere. I've seen a lot of arguments come across my desk about different ways of dealing with illegal immigration in the US, many of which have been backed by simply bad information. In today's post we'll debunk a few myths so you can have your facts straight at your next illegal immigration debate. Some argue that illegal immigrants are a drain on the economy because they don't pay into the system (via taxes) but do receive benefits from the state. What benefits do they actually receive? Illegal immigrants cannot receive social security, welfare, food stamps, or subsidized housing. They will receive emergency medical care even if they don't have health insurance, but as far as I can tell this is mostly because no doctor or hospital is going to let someone die in the street. Undocumented children will receive schooling as well as can possibly receive SNAP benefits, which is a supplemental food program for poor children. 1) Emergency medicaid and emergency medical treatment: not directly, no, however--if an immigrant is being paid under the table (and thus not paying conventional taxes), then they are being paid about 30% less than a US worker. This becomes profit for the company paying them. The US recently dropped its corporate tax rate to 20% on profits, which is much higher than the approximately 0% in taxes that most minimum wage workers pay, and much higher than the tax brackets for anyone making less than $38k/yr. Because these programs are federally funded, the total tax revenues brought in by hiring illegal immigrants may actually be higher than if they were documented and paying their own taxes, because the revenue is raised from excess corporate profits rather than very low wages that wouldn't get taxed (much or at all) anyway. It's difficult to access enough data to know for certain. 2) Schooling: Schooling is usually paid for by property taxes. If illegal immigrants are living in a house, they either own it (and pay property taxes) or rent it (and pay the landlord, who pays property taxes). Illegal or not, if you have a home, you're contributing to the property tax revenue. There are certainly some school costs covered by the state or feds, but most of it is funded by property taxes. The issue of dual-language teaching in US schools needs to be addressed, as well: having an influx in students who don't speak English creates a new difficulty to teaching them. However, it's simply not clear which non-English speaking students in US classrooms are native-born, legal migrants, illegal migrants, or native-born children of illegal migrants. We don't know and we can't, in part because it's both illegal and impractical to interview all of these kids about their immigration status. 3) SNAP: Federally funded, so see #1. And, in fact, a big chunk of that 0.85% is people who are incarcerated for immigration offenses specifically, rather than theft, violent crime, or the like. If you remove that group, you get an incarceration rate of 0.5%. These rates use the "low-ball" estimate of 11-12 million illegal immigrants in the US. If there are more, then the incarceration rate is even lower. You may have recently seen a report from Arizona that claimed that illegal immigrants were incarcerated more, and for more violent crimes. This has a number of problems, not the least of which is the fact that it compares "illegal immigrants between 15 and 35" to the population as a whole. Robert Verbruggen of the National Review, himself not an advocate for illegal immigrants' rights, breaks down why the report is flawed. From a journalistic integrity perspective this Arizona report is horrendous. Of course incarcerations do not directly equal crimes committed, and getting the numbers perfect is complicated. The Center for Immigration Studies can tell you more. But their meta-study did not show any increase in criminal behavior from illegal immigrants vs. US citizens or other immigrants. It is worth noting that the CIS study discusses the "Mexican Commute" style of crime, in which those living in Mexico can cross the border to commit a crime of some sort, and then return to Mexico. Considering this as a separate issue from illegal immigrants--those who want to live here--can potentially help people discuss border security without being forced to rope in the current illegal immigrant population into the discussion. Not to say someone is necessarily a problem in themselves for being an illegal immigrant, but if a substantial and growing portion of the population is here illegally and without documentation that lets them operate like other immigrants, then there's a problem. How many illegal immigrants are in the US, and what's the trend? The total illegal immigrant population followed an upward, linear trend between 1990 and 2007, peaking at 12.2 million. It has since declined and stabilized to about 11-11.3 million. In some ways, then, the problem is shrinking--certainly as a percentage of total US population. We can speculate about what's driven this sudden change, but it certainly correlates with increased border security measures passed during the Bush administration, as well as with the Great Recession of 2008. There's a debate over how effective increased border security in the US would be in deterring illegal immigration across the Mexican border. One fact worth noting is that probably more than 40% of current illegal immigrants are people who entered the US with a legal visa and then overstayed it. A wall wouldn't stop them because they're already allowed to enter. There's also evidence to suggest that current border security measures are already sufficient. First, the total number of Mexican illegal immigrants in the US has been falling quickly since 2007, and non-Mexicans have increased to replace them. 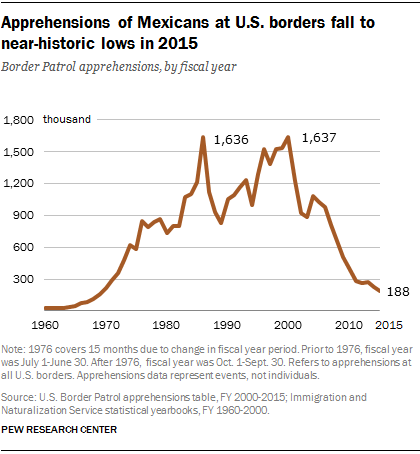 Second, and perhaps more tellingly, the number of apprehensions of Mexicans at the US border has plummeted since the early 2000s. Over this same period, funding for border patrols increased repeatedly, under both Bush and Obama. Together these facts would strongly suggest that many fewer people are trying to get in--there are fewer apprehensions along the Mexican border, mixed with a total decline of illegal Mexican immigrants in the US. So as you run off to your next debate, go in well armed. Remember to have fun, be safe, and don't let the pundits do the thinking for you.